T-MEK is a surprisingly difficult game to review. Atari’s arcade first-person tank combat game was fun and exciting with amazing sound and nail biting action. I have a lot of fond memories playing it at Peter Piper Pizza as a teenager. The 32X version is SO not that game. So, what’s a “MEK” you ask? Well, not what you might think. The term “MEK” immediately conjures up the image of a “mech.” You know, a gigantic walking battle robot as found in the much better 32X game Metal Head. A MEK is something else entirely, essentially a floating futuristic tank. The plot is introduced via text scrolling over a grainy still screen of Nazrac, the evil conqueror who has put together the T-MEK tournament for warriors to gain fame and win a powerful position within his cruel empire. Before the tournament, players select one of six MEKs with names like LurkerMEK and AssaultMRK. The six have different attributes in weapons, shields, and speed. The select screen has a ridiculous, pointless timer that forces the player to make a decision within fifteen seconds, leaving little time to compare one MEK to another. Fortunately, I’ve found that it largely doesn’t matter. There’s not an incredible amount of difference between the different MEK models. Those that have lower weapons might need to make a few extra shots. Those with more speed are hypersensitive to turning and aiming. For the most part the control is going to be agonizing no matter which MEK is used. As battle begins it’s obvious that the 32X doesn’t handle the game well at all. Environments blend into each other leading to combat confusion. The draw distance isn’t deep enough to see enemy MEKs until they’re nearly on top of you, requiring players to rely heavily on radar for navigation. Up close objects look like pixelated 8-bit art. There’s really no other way to put it; the game’s an ugly mess. When confronting an enemy there are three attacks to choose from; rapid fire laser guns, a more powerful but slower plasma cannon, and the special weapon. This configuration is identical on all MEKs. The special weapon is a guided missile that packs the most power. Though it can be piloted, it’s best used in straight shots. It has a large turn radius and puts the player in danger. Flying the missile around the arena for even a few extra seconds is all an enemy needs to destroy your MEK. Unlike lasers or plasma, the special weapon is limited. Each round begins with only two shots out of a maximum capacity of four. Refilling the ammo is achieved by flying under “blue lights” emitted from flying saucers hovering overhead. During the fog of battle the game will announce which direction an attack is coming from in a voice that sounds like it’s coming from a worn out old record. “0Hit from left!” “Hit from right!” It also tells you when you are or are not in the lead, and if shields are low. Shield energy can be replenished by destroying an enemy MEK and taking its power core. A few rounds have objectives, such as “destroy three MEK” or defeating a boss. Typically, however, the winner is determined by who has the most points at the end of each timed round. Points roughly equate to the number of kills made. The only exception is that bosses are worth more than standard opponents. The only way to advance to the next round is by scoring more points than the computerized opponents. Second place isn’t going to cut it. Nazrac is only interested in number one. Be sure to outscore the enemies at all costs because this game commits one of the cardinal sins of arcade ports. It has limited continues; only three. The two multi-player options, challenge mode and duel mode, don’t improve upon the game, and the split-screen makes an already problematic viewing field even worse. 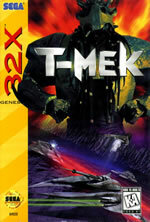 In challenge mode, two human players join two automated MEKs in a four-way death match. Duel mode is exactly what it sounds like: two human players repeatedly blowing each other up and hoping to have the high score when the game time runs out. Fans of the coin-op contemplating this console version should know a few things: there’s a lot missing in the graphics and audio department, the gigantic pink walkers have been excluded, and the Sega Genesis doesn’t have a twin stick controller available. Perhaps as an apology for what they knew was a poor home conversion, the game adds an arcade+2, arcade+4, and an arcade+6 mode, which increase the amount of levels in the single-player game, respectively. After playing through the standard arcade mode, I can’t understand why anyone would want to subject themselves to yet even more rounds. 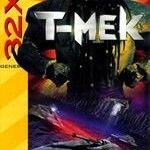 Between the lackluster introduction and cringe-worthy audio, T-MEK is screaming to have been instead released as a 32X CD title. Higher resolution sprites may have also been possible. As one of the last 32X games released in North America, it had a shorter print run then most games, which has caused its rarity and value to continue to increase over the years. If you’re a collector, then by all means track this game down and pick it up. If you’re merely curious, then I suggest saving your money. This review really couldn’t be more wrong. It pretty much loses all credibility by implying that Metal Head is somehow a better game. While T-Mek isn’t a masterpiece of video game design it’s still simplistic tank blasting fun. Despite what the review says the controls are actually quite smooth. The graphics well they’re ugly 1st gen 32 bit graphics, not much worse than 1st gen 3d games on the PS1, so you can only slam this game so much for being developed in 1995. All the shortcomings aside this game is still fun because of how simple it is to play, it’s able to support of a lot of enemies in combat at a single time which leads to some pretty epic battles, especially on 2 player mode.